Meet our newest team member, Bad Law Bot! We’ve enhanced our Authority Check feature to show you where courts have noted that a case has been treated negatively (i.e., reversed or overruled on any grounds). The Bluebook requires that courts indicate negative history of cases cited within opinions. Our new feature, “Bad Law Bot,” uses algorithms to find negative citation history. Bad Law Bot then flags those cases that have negative citation history and provides you with the links to those cases. In the example below, we looked up Ohio v. Roberts, 448 U.S. 56. Note the red flag next to the case name, indicating that there’s negative citation history for the case. Once you click through to Roberts, you’ll also notice that there’s a red flag in the Authority Check area. To see the cases that indicate negative citation history for Roberts, simply click on the Negative Treatment Indicated link and the Authority Check report will open in a new tab. Here’s what the Authority Check report looks like for Roberts. Bad Law Bot finds negative citation history by taking all the cases that have cited Roberts and examining how they’ve cited to Roberts. 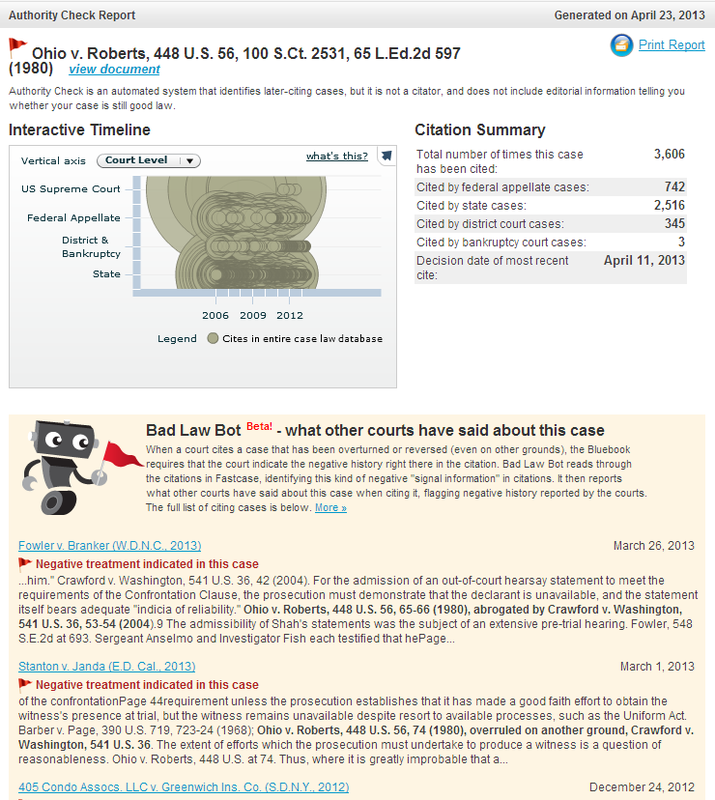 If a court has negatively cited to Roberts, Bad Law Bot will link you to that case. Keep in mind that Bad Law Bot determines negative case history by using algorithms, and that it is not intended to be a complete replacement for a full editorial citator or for reading all later-citing cases. A red flag means that there’s likely negative treatment, since a court has said as much by their use of a negative citation, but no red flag does not necessarily mean that a case is still good law. If a case has been overturned but no court opinion has cited to it yet, Bad Law Bot won’t be able to find any citation signal information. Bad Law Bot is a part of Authority Check, so it’s already included in your subscription!